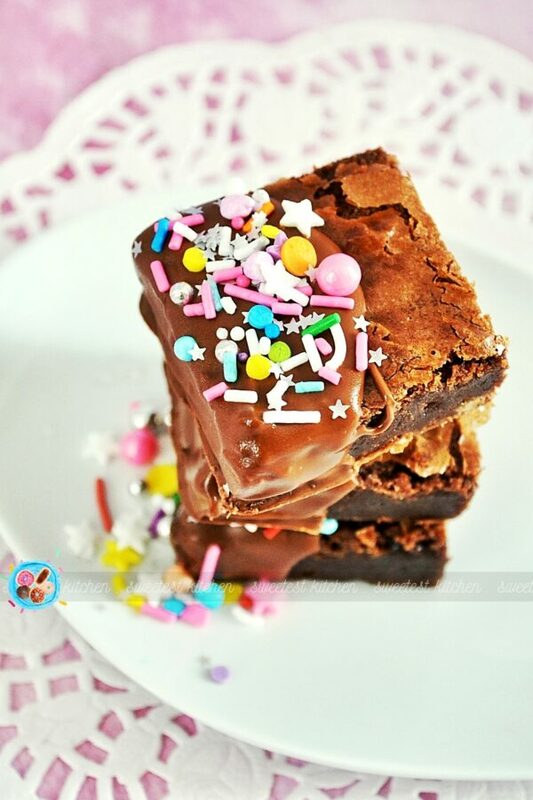 Milk chocolate-coated brownies that are sparkling with sprinkles! 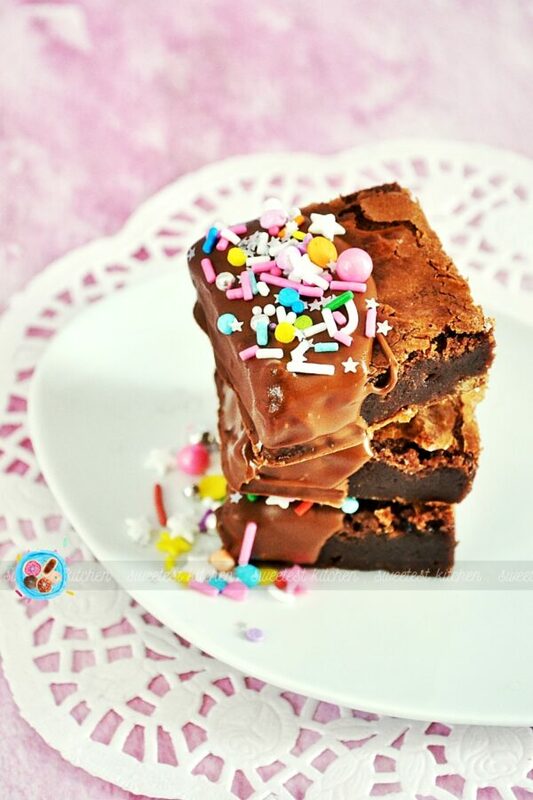 Unbelievably fudgy and easy to make! When you’re feeling stressed, frustrated and fed up with the world, what do you do to calm yourself? Maybe curl up all cozy-like on the sofa and watch a movie? Dig into a tub of Ben & Jerry’s? Read a book? Go on a walk? Needless to say, with four children, ranging in age from 4-11, I get stressed, frustrated and fed up quite a bit! 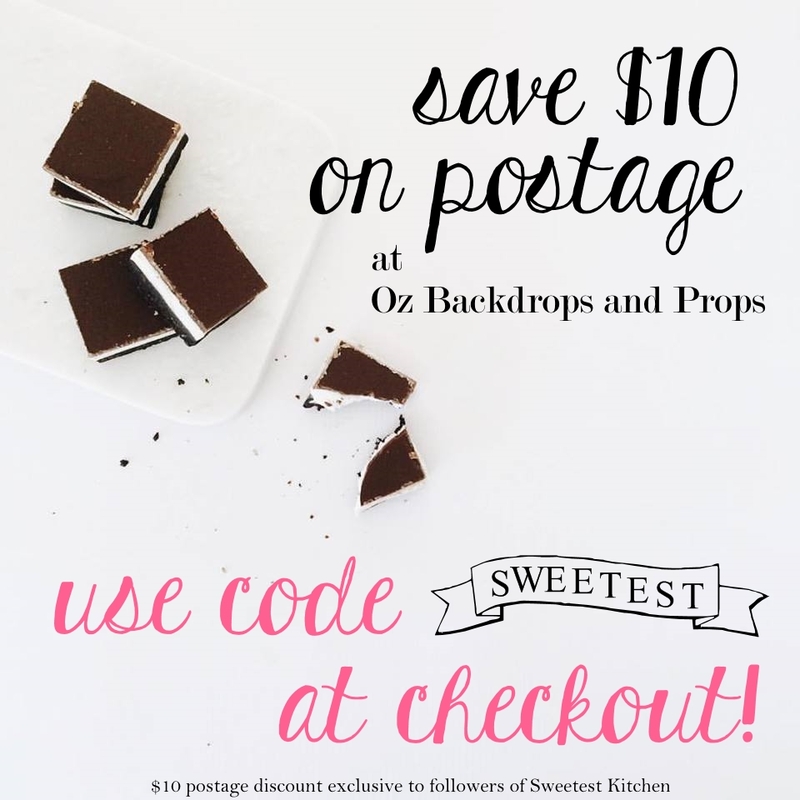 As my recently-found stress relief method is very important to me now, I thought I’d just take a few moments to talk about it (I don’t usually get very personal here, I know, but this might give a little bit of insight about me and what goes on behind the scenes at Sweetest Kitchen headquarters!). Stress relief for me involves a 3-hour long playlist of my favorite Nirvana and Hole songs. Before I go any further, let me warn you, I am very closed-minded with my music. I have my favorites, and that is all I listen to. You can tell me to listen to *this band* or *that band* because they sound similar to one of my favorite bands, but yeah, no. I can’t do it. Not because I don’t want to – I’m sure your band recommendation is a good one -, it’s just that what I’m listening to is absolutely perfect and I can’t squeeze in anything else. So, I listen to my playlist every. single. day. It’s always on shuffle so it goes in a different order each time. I’m not stressed out every single day, but I love my Nirvana and Hole songs so much, that, yeah, I can’t listen to anything else (I couldn’t even force myself to listen to anything else). When I am feeling stressed, though, it takes about an hour or two of that playlist until I return to normal. I can’t explain why. The music, the lyrics, the sound of Kurt’s and Courtney’s voice, they all work together and I get something out of the songs that no other song has ever done for me. I tried to post on my personal Facebook page one day recently about this. About how I used to absolutely love Nirvana back in my high school days, and that it had now been years since I listened to the band. A few years ago, I popped on a few songs from Nevermind, and as much as I thought I would like to hear those songs again, I surprisingly found that I didn’t like them. It’s hard to explain, I can’t really explain it properly in words… it’s more of a feeling. I loved Nirvana back in my day, and I lost Nirvana for a long while. Then one day last year, I was driving home from school dropoff (or pickup?) and the 60s/70s/80s/90s radio station I listen to played the first Nirvana song I had heard in freaking years. Come As You Are. I remember exactly where I was, I was just approaching the pedestrian crossing outside one of the local schools, the crossing guard was standing there. And the opening part of Come As You Are started playing. I listened, and then I suddenly felt really different, kinda froze in place. Took me a moment to realize I could drive across the crossing now the guard had moved. That song playing on the radio that morning totally changed me. Well, not completely, and not totally, but maybe what I mean to say is, it gave me something. It gave me an identity back. Made me remember that many years ago, I did have an identity and I felt really happy with who I was. And then I went off and met someone crazy who wanted to get married and have kids (seriously, what was I thinking!? Haha!). And momhood took everything away from me. Well, it gave me kids, but it took away everything about who I myself was. For many months now, and I know this sounds crazy because most people listen to a variety of music, but I’ve always been closed-minded about music, like, really really closed-minded, for many months now, I have listened to Nirvana every. single. day. Some days I don’t, like when everyone’s home on weekends, or when the husband’s working from home, and I can really feel the frustrations set in when I haven’t listened to Nirvana for a while. Then, when I finally hit the play button again, and those songs blast out of the speakers, a calmness, a freeness, a happiness, a blissness, washes over me like a waterfall, and everything is right again. No other music, no other voice, has ever done that to me. I added Hole to my playlist this past December after my daughter mentioned she had read about Courtney Love and Hole in a book about the best 1000 songs. Then I remembered how much I loved some of Hole’s songs and, sure enough, the Live Through This album did the same thing for me as when I heard Come As You Are on the radio earlier last year. All the memories, all the memories about who I was, came flooding back and I realized that this is who I am. I feel really happy to have rediscovered this and to have a real identity for myself, other than just a boring old worn-out mom. Every day these songs bring me peace, happiness, realness and energy. My playlist is indeed my daily medicine that keeps me sane. I don’t even bake or take pictures without my music! Each photograph on this blog, for the past year, comes with a 100% guarantee that Nirvana or Hole was playing in the background while it was being snapped! To me, music is very personal, so I kind of feel that you may know me just a little bit better now that you’ve read this post (if you even had the patience to read through it!). I don’t think anyone would know about my Nirvana obsession by just looking at me, but my insides are always screaming Nirvana, just like Kurt will always be screaming his lyrics throughout the universe for eternity. You may have noticed that I’ve posted a couple of pictures of a stack of brownies throughout this post? Yeah, I’m sorry for the distraction! 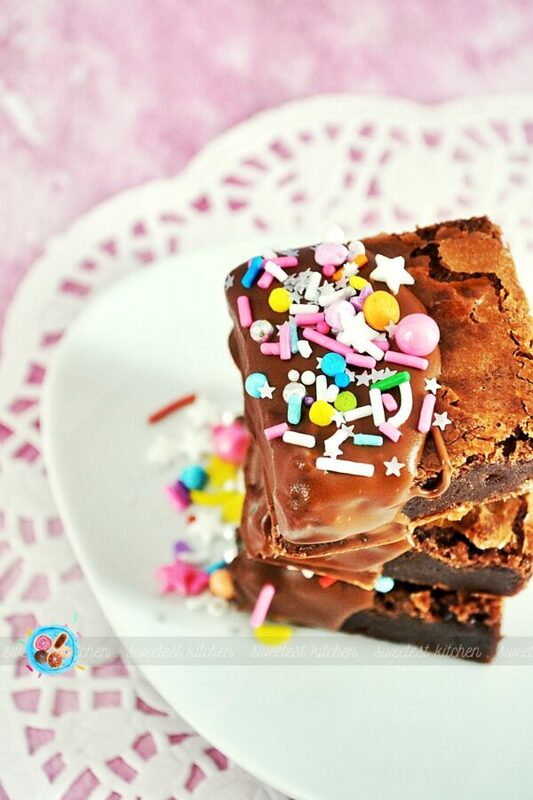 These brownies are awesome! I ordered some Sweetapolita sprinkles recently, and I really wanted to use them on something, anything! Not a gigantic multi-layer cake, but something a little bit easier and perhaps fudgier…. maybe…. brownies! Dipped in chocolate! With sprinkles! Yep! That’s what I’m talking about! These are basically melt-and-mix brownies, which involve melting some unsweetened chocolate and butter, then just mixing in the sugar, vanilla, eggs and flour. Easy! Once removed from the oven, the brownies need to cool completely. Then you can cut them into squares and, to make them easier to work with, freeze for about 30-45 minutes to firm them up. A quick dip in melted chocolate and a scattering of sprinkles to finish them off, and you’ve got some pretty awesome-looking brownies! Note, I used Flight of the Unicorn twinkle sprinkle medley from Sweetapolita’s sprinkle shop. Preheat oven to 180C. Line a 20x20cm square baking pan with baking paper, leaving an overhang. Place butter and chocolate in a heatproof bowl set over a pan of simmering water. Do not let any water touch the chocolate. Melt, stirring occasionally, until smooth. Cool for 5 minutes. Whisk in sugar and vanilla extract. Add the eggs, one at a time, whisking well after each addition. Using a wooden spoon, stir in the flour until fully incorporated. Spread batter into the prepared pan and bake for 18-20 minutes, or until a toothpick test comes out clean. Cool brownies completely, then cut into squares with a sharp knife, wiping the knife clean after each cut. Place brownie squares in the freezer, in a single layer, for 30-45 minutes to make them easier to work with (cold, firm brownies are easier to dip into melted chocolate!). Meanwhile, melt the milk chocolate (or your preferred chocolate) in a heatproof bowl set over a pan of simmering water (don't let any water get in the chocolate), or melt in the microwave. Line a baking tray with baking paper and set aside. Remove brownies from the freezer and dip half of each square into the melted chocolate (use a spoon to help with coverage, if necessary). Scrape excess chocolate from the bottom of the dipped brownie, then set the brownie on the prepared baking tray. Decorate with your favorite sprinkles and leave to set. Repeat for remaining brownies.